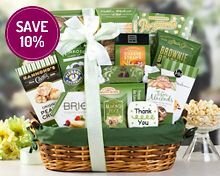 Send thanks with this gift basket and get a bigger thank you in return. • Filled with butterscotch hard candies, almond cookies, brie cheese spread, brownie brittle chocolate chip, caramel lollipops, cheddar cheese straws, peanut brittle, sesame crackers, Ahmad English tea, Rocky Mountain Chocolate Factory milk chocolate hot cocoa, walnut shortbread cookies, Popcornopolis kettle corn, honey hard candies, a freshly baked thank you cookie and more, it's a great way to recognize those who have helped. • Gift Size: 18" x 11" x 14"
If you have any questions about this product by Wine Country Gifts, contact us by completing and submitting the form below. If you are looking for a specif part number, please include it with your message.